In the age of social media, sites like Facebook and LinkedIn make it nearly impossible not to compare ourselves with others, particularly when it comes to careers. For many of us, our job histories and experiences don’t follow a linear path or even look like anyone else’s. That’s not a bad thing—and we’re far from alone. 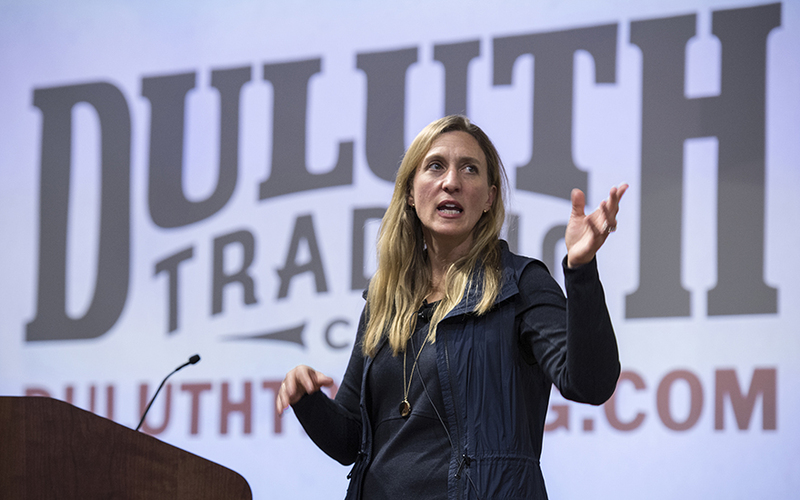 “What I’m going to share with you is that no matter what you hear tonight, no matter what you hear from your bosses or your professors, your path is going to be totally different,” said Stephanie Pugliese, president and CEO of Duluth Trading Company, before an audience of Wisconsin MBA students and alumni taking part in the Wisconsin School of Business’ M. Keith Weikel MBA Leadership Speaker Series. Pugliese told the audience how she Googled “career path” prior to her talk. The resulting image showed a man in a suit carrying a briefcase, moving in a straight skyward direction. It didn’t resonate. Intrigued by business since the age of 18, Pugliese received her bachelor’s degree in marketing from New York University’s Stern School of Business. After graduation, she worked in retail merchandising with Ann Inc. for nearly 11 years. In a decision made in the aftermath of September 11, 2001, Pugliese and her husband moved to Italy—his native country—to raise their three young children and run a bookstore. Returning to the U.S. in 2005, Pugliese held several executive positions with Lands’ End before landing at Duluth Trading Company in 2008. At Duluth, she rose from vice president of product development to senior vice president and chief merchandising officer to chief operating officer to president, and in 2015, to CEO. Learn from each stage. Looking back, Pugliese said, each of her experiences built on the one before it. Even when there didn’t seem to be a direct application at the time, she drew something valuable from each one. When Pugliese and her husband moved to Italy, she envisioned herself as a stay-at-home mom, which lasted “about 63 days.” After one of her daughters asked if they could visit Barnes & Noble—which wasn’t anywhere near their vicinity—it sparked the idea of creating a children’s bookstore, recreating the reading and browsing experience in their new small town of 4,000 residents. Pugliese and her husband added activities like arts and crafts days, reading days, and book fairs with local schools. “I went from executive to hands-on,” she said, using the opportunity to apply her business acumen and creativity in a vastly different environment. Forging your own career path is less about knowing all of the answers and more about fostering your entrepreneurial spirit and the courage to find out. It’s also what employers look at, too. As part of the Duluth hiring process, Pugliese meets personally with prospective talent, searching beyond just an individual’s skill set. 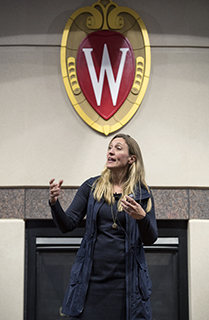 The M. Keith Weikel MBA Leadership Speaker Series enables Wisconsin MBA students and alumni to interact with and learn from accomplished business leaders. 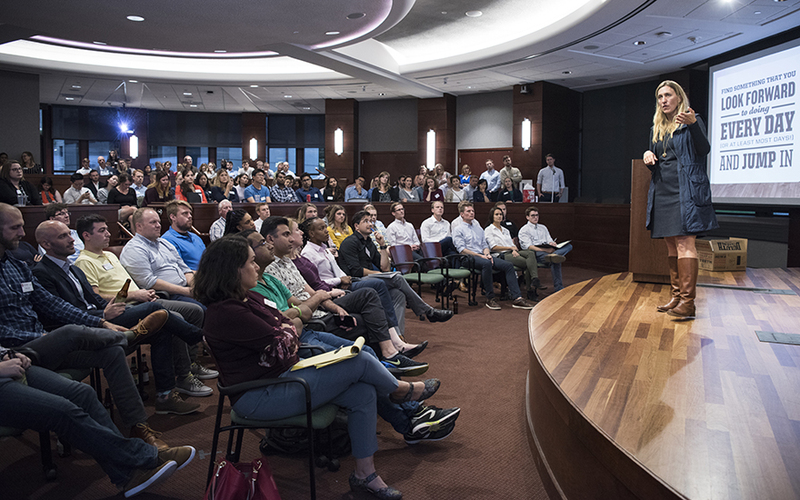 Students deepen their leadership skills by hearing the distinct perspectives of these visiting business leaders. The series was established in 2004 with a gift by John J. Oros (BBA ‘71) and his wife, Anne Wackman. Today, the series continues as the M. Keith Weikel MBA Leadership Speaker Series thanks to a gift by M. Keith Weikel (Ph.D., Marketing and Economics, ‘66) and his wife Barbara.